Golden Knights Lacking Offense; But Why? In their first three games, the Golden Knights are outshooting opponents 104 to 72 in shots on goal. The numbers are even more staggering when you include all shots, 197-125. That’s a Corsi For Percentage of 61.2%! Yet Vegas is 1-2-0 and have been outscored in the only category that matters, goals, 10 to 5. So the stats seem suggest Vegas had plenty of scoring chances in Buffalo but Jack Adams winner Gerard Gallant didn’t agree following the game. Sometimes Gallant can be a little emotional, irrational even, in the pressers after losses, so we decided to take a little deeper dive to see if the Golden Knights are indeed taking harmless shots, if it’s just been a case of tough luck early, or if it’s some combination of both. According to NaturalStatTrick.com, the Golden Knights had 22 scoring chances on 37 shots. That’s down significantly from the first two games in which Vegas had 33 (PHI) and 31 (@MIN) scoring chances. 22 is very low for the Golden Knights when compared to last year. Just 13 times did they have fewer than 22, including the other time they visited Buffalo. 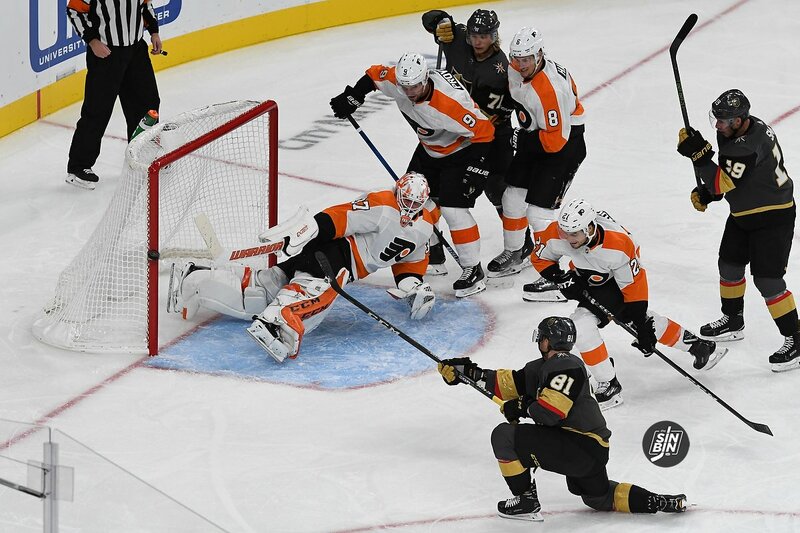 However, the Golden Knights went 8-3-2 in the games in which they had fewer than 22 scoring chances. So, that’s not a great indicator of success. The next stat, and this is an odd one, is Corsi or Shot Attempts. Vegas outshot the Sabres 67-35 for a Corsi For Percentage of 65.7%. Only one time all year, including the playoffs, did the Golden Knights create a higher discrepancy in shots. That was the famous night before Thanksgiving game in Anaheim where they overcame a 2-0 lead to win 4-2. Vegas hit 64% or more five other times last season and they went a winless 0-3-2 in those games. In other words, massive Corsi differences does not equal success for the Golden Knights. Instead, it likely indicates they are forcing bad shots and inflating the numbers rather than working for good ones. That brings us to the heat charts. Where are the shots coming from? Most goals in scored in the NHL come from directly in front of the goal, so the darker the color in the crease and right in front of it, the better. Against Philadelphia, it looks pretty good, in the other two, not so much. Also, take a look at where the goals are coming from. Just one has been in the goalmouth, the other four have all been beyond the dots. Scoring chances and good scoring chances are completely different animals. Same goes with shots and good shots. The Golden Knights are racking up the numbers, but aren’t getting the good varieties. It’s like what my doctor always tells me about my cholesterol. Damn you cheese. However, as always in hockey, there is an element of luck, and the primary number to describe that, PDO, is basically kicking the Golden Knights in the nuts. 91.9 is the Golden Knights PDO after three games. 91.9!!! If you don’t remember how PDO works, read this, but if you do, 91 point effing nine! That means, the Golden Knights shots aren’t going in and their opponents are, at an alarmingly high rate. This is where sample size comes in, and why freaking out after three games makes you look like an idiot is not the smartest thing to do. Last year the team with the worst PDO was Buffalo with 98.0, the team with the best was Tampa Bay with 102.0. Both are two points off the norm (100). The Golden Knights are currently 8.1 PDO points off the norm, so relax, it’ll turn. All in all, there are some issues, mainly the fact that the Golden Knights are not taking enough shots from the dangerous areas. But, after three games, and having had the lead for less than 5 minutes of the 185 the Golden Knights have played, it’s not time to panic. If this continues for another 10 games though, then we’ll all have reason to be as angry as Gallant was after last night’s game. Even then though, I don’t think we’ll ever snap at Jesse Granger like that. Great analysis. This is what I was feeling but don’t have the time or patience to dig into all these stats. Hoping it turns around soon and before anyone else goes down. Kinda feels like it was eaiser to replace the goalie than find complete new lines every few games.